The Learning Station is a small, independent app development company dedicated to early literacy. Founded by Libby Curran, award-winning teacher, People Magazine Teacher of the Year, and author of hundreds of engaging beginner books, the company's mission is to get early readers onto the first rungs of the ladder to reading success. Over 20 years of teaching, Libby has developed a proven way to promote a love of reading and build literacy skills by dramatically increasing the time spent reading easy and enjoyable books. Since books at the easiest reading levels are not readily available in bookstores or libraries, Libby teamed up with Joseph Chen, developer of the innovative Edify quiz-generation software, Andrew Friday, Game Designer, and Evan Curran, a talented children's musician, to create the Reading Train. The Reading Train combines a deep and multifaceted library of hundreds of original, classroom-tested and kid-approved eBooks designed specifically for beginning readers, with an integrated picture/audio dictionary, sing-along song books and fun, text-based games to build foundational skills and get every child reading, right from the start. 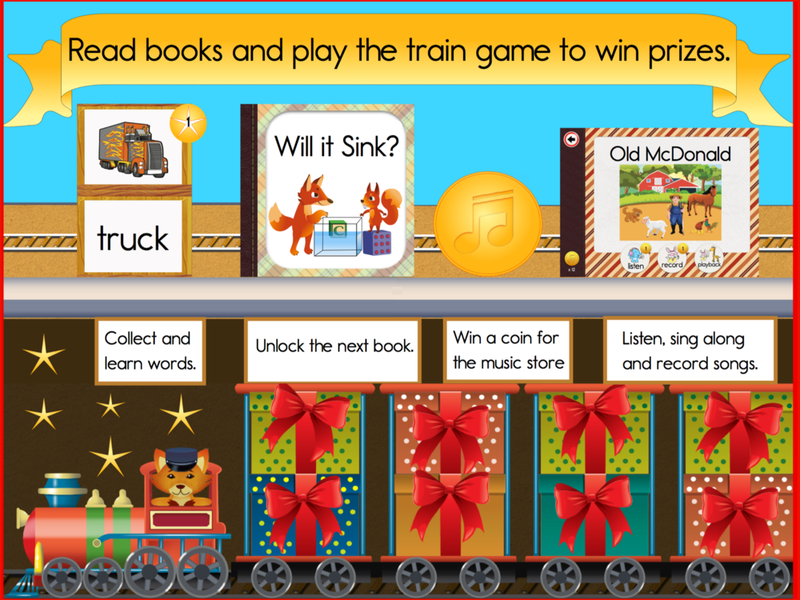 After reading a book, Reading Train apps generate a unique set of quiz questions presented as the Train Game that assess children's understanding of what they just read. Each level of books has a carefully calibrated quiz that meets the unique needs of a student at that given level, including spelling, sentence completion, word matching and reading comprehension in an absorbing game that is different every time you play. As children continue through the units, they acquire vocabulary, phonics skills and sight words and move from beginning reading to reading independence. 450+ Word Audio Dictionary, Song Books and More! Our audio dictionary, with illustrations and audio definitions provides kids with the opportunity to learn more about the words they are reading with a simple definition that is read aloud when tapped. Besides a FREE, powerful dictionary, we children can enjoy a large collection of song books. For every book read and quiz game completed, children earn coins that they can spend in the music store. They can listen to songs and even record themselves singing along. Tap on any word to get a detailed explanation, including a definition and image, empowering children to read completely independently. On the parents' page, adults can view books read, overall scores and scores broken down by book and question type. Question types include matching, sentences, spelling and comprehension. With an unlimited number of profiles allowed, teachers can share an iPad with all of the students in a class and monitor their individual progress.